As a side note, The Journal calls all ten of it's fiction picks "novels" and mistakenly states that this is Lasdun's debut collection. In fact, his first was Delerium Eclipse in 1987 (published, I believe, as The Silver Age in the U.K. in 1985). Despite these errors, however, it's the thought that counts, and short story collections on The Journal's list are sure to come to the attention of more readers. Elsewhere, NPR critic Alan Cheuse, includes Daniyal Mueunuddin's In Other Rooms, Other Wonders among his seven summer picks. This, I have read, and can highly recommend. It definitely lives up to the excellent reviews it has received. So this summer, grab a short story collection to take along to the beach or the mountains (or, in my case, the NJ Transit's Montclair-Boonton line). Congratulations on winning the Man Booker International Prize. Your brilliant stories are clearly deserving of this honor. 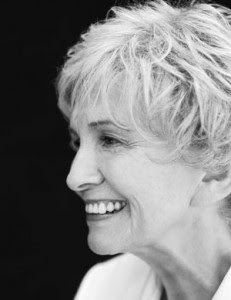 It may embarrass you to hear this yet again, but you are one of the greatest living writers in the English language, and it's quite an achievement to have earned the kind of recognition you have for almost exclusively writing short stories, a notoriously underappreciated form. You are known for being modest and unassuming, which has its charms, but I think it's time for you to own up to your importance--and the importance of the short story form. Scores of writers nowhere near your equal are more than willing to assert their significance, which in very few cases approaches yours. And I would bet your work will be read long after most of theirs is forgotten. So when you accept the Man Booker International Award (and, who knows, maybe even the Nobel prize some day), please skip the self-effacement, and be proud of your work, your accomplishments, and the mark you've made with your stories. For the first time that I know of, it's now possible to easily sell an electronic version of a short story online. Scribd.com, which had previously allowed users to post text to its site, has created an online store (in beta release) that allows authors to sell their work, set their own prices, and pocket 80%. That may not sound like a very big deal, but when you add social networking through the likes of Facebook and Twitter--not to mention Scribd's built-in community--this allows writers to bypass literary magazines and offer short works for sale directly to readers. I could see this being a tempting possibility for established writers of short fiction. Say you've written a very topical story that it would be best to publish as soon as possible or one tied to a holiday or event. The only print outlet that could possibly publish it within a few weeks is The New Yorker. And everyone knows what a long shot selling a story there is, let alone getting it published when you'd like it to. Beyond that, you're likely to wait months if not years for your story to appear elsewhere, even if you place it immediately. So why not put the story out yourself? You could charge $1.25, and pocket $1 for every copy you sell. And you could time publication so that the immediacy of the story becomes a virtue rather than a drawback. Of course, writers could also bypass book publishers and post an entire short story collection--the digital equivalent of self-publishing. But I think, unless you'd be doing it to also make each story available separately, you'd be giving up too much. In addition to prestige, publishers can offer print and digital distribution and the backing of their design, sales, and marketing teams (not to mention editing that could sharpen the writing). Getting something you published on Scribd reviewed would be nearly impossible. And most readers still prefer books to reading off a screen. More and more, however, are doing their reading on Kindle, the Sony Reader, handhelds, and other devices. The downside is that this kind of disintermediation does pose a threat to literary magazines, which are an essential part of the literary community. But they can make use of the direct-sale capability themselves by opening their own Scribd stores to sell individual stories, poems, and essays under their respected imprimaturs. To be sure, many short stories are already available on the Web for free on the sites of print and Web only literary magazines. But why not make work available for purchase, instead, and make some money for the publication and author? The Scribd store even opens up the possibility of establishing an online Web 'zine that delivers stories to readers without even having to set up a Web site. The possibilities are vast. Here's one more: How about fund-raising for a charity or nonprofit by selling stories, poems, and essays on-line? Thanks to Scribd, the logistics have never been simpler. For those who missed it (and those who want to see it again and again and again), the Web cast of The Story Prize event is up on FORA.tv. In case you've forgotten, Jhumpa Lahiri, Joe Meno, and Tobias Wolff (spoiler alert! )—the winner—read from their work and discussed it onstage. And by the way, that's novelist Helen Schulman introducing the event. She's head of the fiction writing department at the New School. The evening is always a blur to me, so I'm glad that I can watch it later and critique my own performance. I don't prepare questions ahead of time, so I'm never quite sure what I've said. Jhumpa Lahiri talking about how her children keep her grounded as a writer. Joe Meno comparing his approach to writing to visual artists' approach to their work. Tobias Wolff revealing that a real-life bank robbery a friend had witnessed inspired him to write "Bullet in the Brain." I'm also struck by how much each writer has to say about their thought processes. When former New Yorker staff writer Daniel Baum started to spool out on Twitter the story of how he lost his position with the magazine, it got a lot of attention. At first, I had some catching up to do, which meant going to the beginning of Baum's stream and scrolling up until I was following in real time, but once I did, I found that reading his story one tweet at a time felt intimate, conversational, confessional—more than just a gimmick. 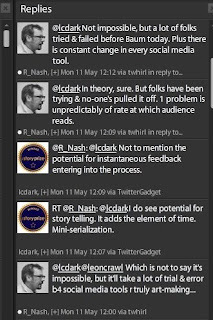 On this blog and Twitter, I usually stay on message and focus on short story collections, but Baum's posts and others' reactions to them drew me into an exchange about the potential for storytelling via microblogging. And to my surprise, I found myself touting the possibilities. Some thoughtful points Richard Nash made led me to consider how writing a story using this platform could work in a genuine and interesting way. I'm relatively new to Twitter, and no doubt others have previously taken up this exact subject and approach. I'm also not well-versed in experimental fiction, so I can't make an informed comparison to hypertext or Excel or PowerPoint or any other experimental e-fiction. But somehow this clicked with me. So how would could someone writing a short story use Twitter effectively? The best analogy, as Sarah Weinman pointed out, is to serialization—in this case it would be microserialization. The biggest difference between this and Charles Dickens' serialized novels or, more recently, Denis Johnson's Nobody Move, have to do with the size of the installments and the means and frequency of delivery. The spirit, though, seems similar. What would work particularly well on Twitter would be stories that could convey a sense of speaking directly to the reader. Along the way, the writer could consider responses from followers, which could influence the story he or she is telling. And all of the posts from others would comprise metatext to the story itself. Ideally the writer would be composing as he or she tweets and not simply copying and pasting prewritten text. That doesn't mean an author couldn't be working from notes, an outline, or a draft. In fact that would make it more like composition and less like improvisation. At the end of the process, would lie a complete story or perhaps a draft of one. In fact, the writer could take this story, possibly incorporate feedback, and shape it into a more conventional text narrative. What's most interesting is that, in effect, the reader would be witnessing--and possibly assisting in--the creation of a story. I'm not suggesting microserialization could/should/would replace traditional short stories. It's just a potentially new platform. Technology is moving fast, and I think interesting opportunities lie ahead for short story writers. Who knows? Great Twitter stories may just be waiting to be written. 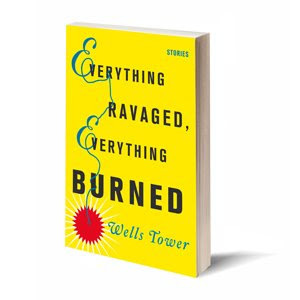 Last night, after the Happy Endings reading at Joe's Pub in New York, I introduced myself to Wells Tower, whose collection, Everything Ravaged, Everything Burned, has gotten great reviews and is selling very well. The temptation is to say "selling very well for a short story collection," but most authors of any book would be happy with comparable sales; it made it onto The New York Times extended best-seller list, as well as the American Booksellers' extended list, and I'm sure others. Of course, Wells and I started talking about short story collections, and he told me how earlier on some had tried to discourage him from writing a short story collection. He also said that he'd been told it would be better if it were a book of themed or connected stories. Luckily for readers, he pursued his own vision. And the results have been critical and commercial success. Of course, I've heard anecdotes like this countless times. The conventional wisdom among editors and publishers is that short story collections not only don't sell but they won't sell. Jhumpa Lahiri has proven that theory wrong twice, and Tower, with his first book, is doing the same--and with no major book award, no Oprah, no previous following, and no film versions of his work. Maybe now agents, and especially editors, will put the old truisms to rest. A great short story collection can do well if you get behind it (kudos to Farrar, Straus & Giroux, Towers' publisher). So please stop discouraging writers from doing what they do best. I've seen too many natural short story writers forced into writing novels, when all we should really ask from artists is that they give us their best, no matter the form--even if that form happens to be short fiction.